HydroFLOW physical water conditioner causes dissolved calcium to precipitate in the water stream, and cannot attach to pipes and equipment. HydroFLOW reduces water, energy, and chemical use, while improving water quality. This technology is USDA Certified for Irrigation Water Treatment and Processing Water Treatment. Sizes available : 12 different Industrial and Commercial sizes from a maximum outside diameter of 1.5 inches up to 18 inches. Our solutions reduce operating costs of water, energy and chemistry, which is validated with automated data collection. This water conditioning technology deliver cost reductions that improve sustainable practices for the long term; reducing energy and chemical use, saving water. 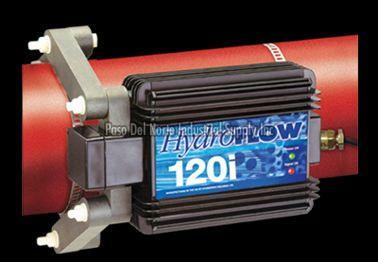 Paso del Norte Industrial is a dealer of this unique HydroFLOW water conditioners that are powered by the patented Hydropath technology. These environmentally-friendly devices have been distributed throughout the world for many years, but only recently entered the U.S. market. Over twenty years ago, Hydropath Technology Ltd., located in the U.K., invented a process that treats fluids by inducing a robust yet harmless signal of ±150kHz throughout plumbing systems made of any material. The pipe, and/or the fluid inside of it, acts as a conduit which allows the signal to propagate. The induction of the signal prevents scale and biofilm from accumulating inside plumbing systems and gradually removes existing deposits. This preventative action significantly reduces energy, chemical, water and maintenance costs which extends the service life of equipment and pipes. Additional benefits of HydroFLOW : In addition to treating scale and biofilm problems, H yd ro FLOW water conditioners can enhance filtration efficiency and significantly reduce corrosion in plumbing systems. It is important to note that the devices are nonintrusive and do not change the chemical composition of the fluid in the plumbing system. What sets HydroFLOW apart from other water conditioning technologies? Other products such as permanent magnets, electromagnets, wires coiled around pipes, etc. state they effectively treat scale and/or biofilm. These products are limited in their effect compared to HydroFLOW. Primarily, this is because they have a very weak signal, depend on flowing water, treat the scale and biofilm at a single point and their effect begins to decay as soon as the fluid passes the unit. What are the applications for HydroFLOW? Popular residential applications include water heaters, pools, spas, appliances, swamp coolers and wells. Commercial and industrial applications include steam boilers, cooling towers, heat exchangers, pools, water features and filtration systems. Additional applications and markets our technology benefits include irrigation systems, municipal potable water systems, aquaculture, reverse osmosis systems, golf courses and parks, wastewater treatment plants, shipboard water systems, mining and construction. Helps meet government reduction mandates for energy, chemical and water usage. USDA 2746 and 2790 Certifications. Agriculture - When used in overhead irrigation systems, HydroFLOW reduces scale on crops, improving the quality, value and yield as well as decreasing water and chemical usage. Pools and Spas - Dramatic improvement in water clarity, scale build-up and chemical consumption, which decreases the chlorine smell and eye irritation. Wastewater - The award winning HydroFLOW water conditioners can significantly reduce struvite build-up, decrease polymer usage and increase cake dryness. Holding Ponds - Control of algae blooms in agricultural and industrial applications. Foodservice - Recognized by the National Restaurant Association as an innovative technology which improves the "back of the house" operations and benefits foodservice operators. Cooling Towers - Maintains cooling systems within industry standards while reducing chemical and water usage. Models S38, HS48, 45i, 60i, 100i, 120i, 160i and Custom models 10 inches up to 18 inches.